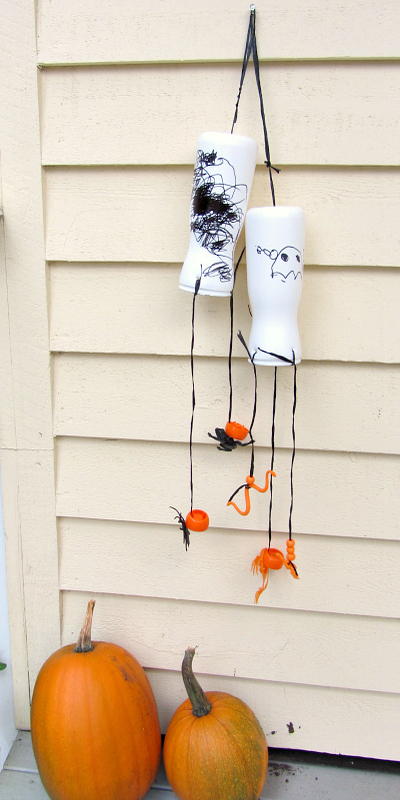 This Halloween craft was unplanned but when I asked the kids what they wanted to make they both said something to decorate for Halloween. So we gathered up some recycled materials and this is what we made! Both my kids really got into this and as simple as this recycled craft is there are lots of little bits that are really great skill builders. 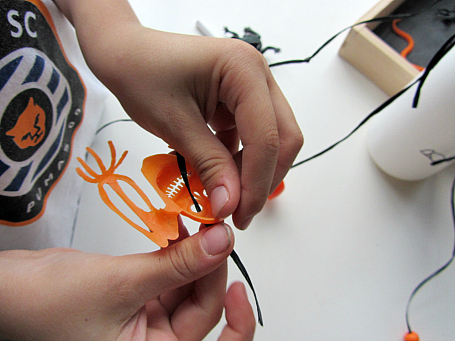 Drawing on the plastic required that they use very steady hands, threading the beads and knotting the thread required good fine motor skills and eye hand coordination. I just love that in the 36 hours since we made these my son has asked me 4 times if I think the Trick- or-Treaters will like his because he thinks they will. He’s proud of it and should be. Gather your materials. You will need a recycled plastic container. We used puffs containers but anything cylindrical that you can punch a hole through will work. 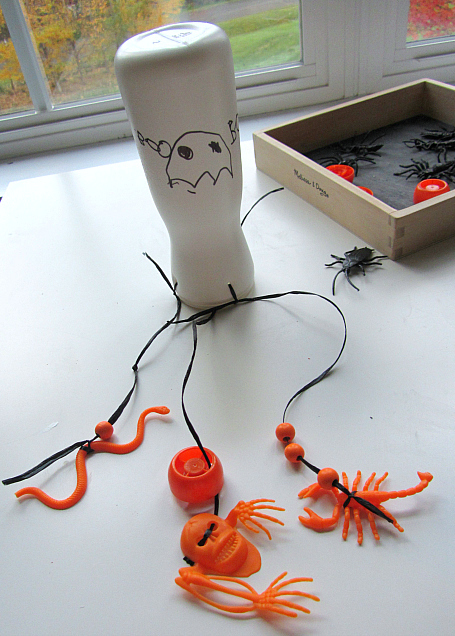 You will also need some string, permanent markers so the ink stays on the plastic, some beads ( we used applesauce pouch tops as beads too), scissors, something to poke holes with ( I used a screwdriver) and orange and black plastic creepy crawlies. Start by making holes in the container in the middle of the top ( really bottom) and 3-4 an inch or so from the bottom. 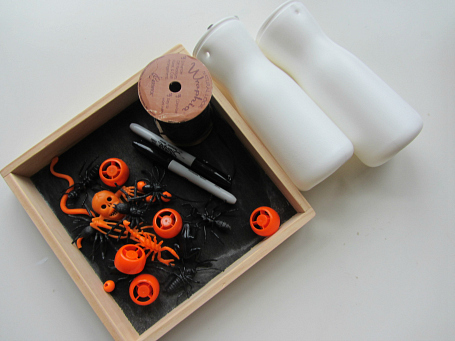 Have your child start by drawing your monster or ghost on the container. 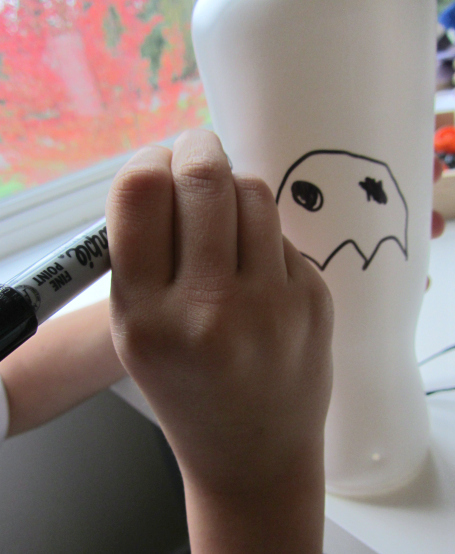 My son included some writing on his making his ghost say “Boo!” while my daughter just didn’t stop – she must have drawn on it very carefully for ten minutes straight. No wrong way to do it. 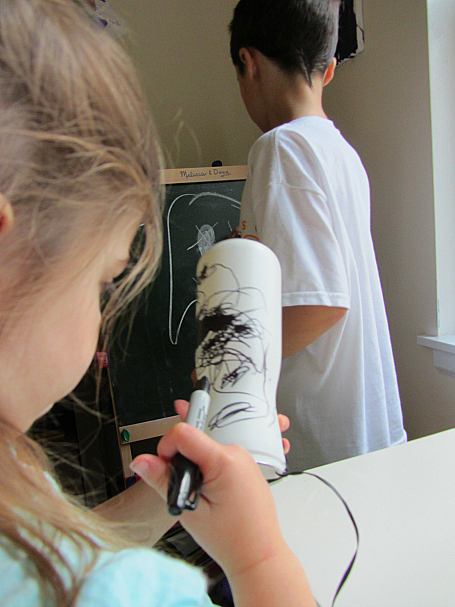 Tip: If you get permanent marker on some surfaces you can use dry erase marker to remove it. It works on my IKEA table every time! Let the marker dry for a few minutes. 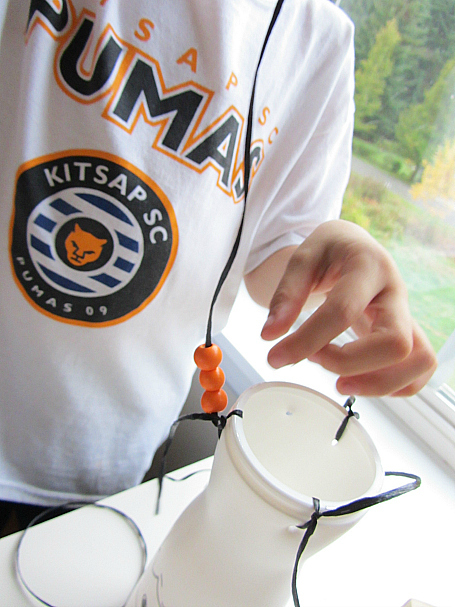 Time to thread the string through the bottom holes and knot. My son did his and I did it for my daughter. 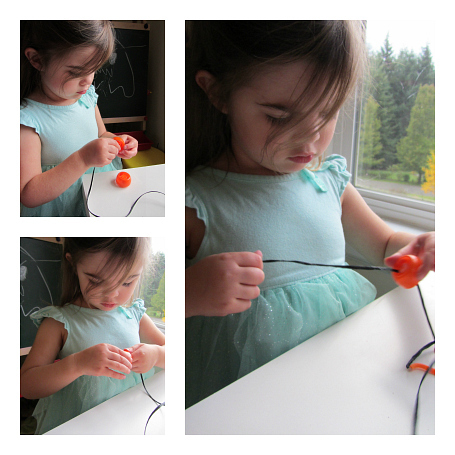 This is great knot practice for kids working on perfecting tying their shoes. My son had three strings to add beads and plastic creepy crawlies on to and my daughter had two. 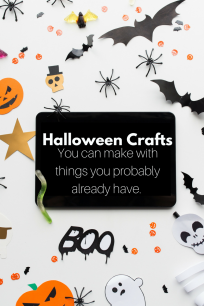 Making the same craft with different ages is easier if you make little accommodations like this to avoid too much frustration but still including all your kids. Thread some beads on the strings. Tie a creature on the end and knot. Next I put a thread through the hole in the top, tied a lid on as a stopper on the inside and made a loop on the outside as a hook to hang it up. 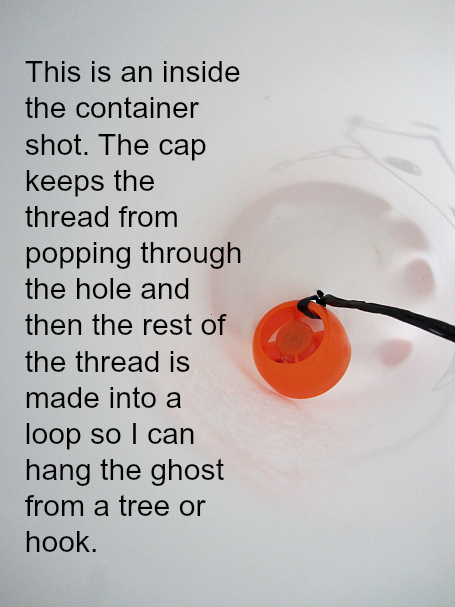 This just makes sure that the thread doesn’t pop through the hole and the wind chime. My son’s craft was done and he was off while my daughter was still busily creating her drawing. These squisher caps were great “beads” for three year old fingers. She threaded it on without help. I did the knots. 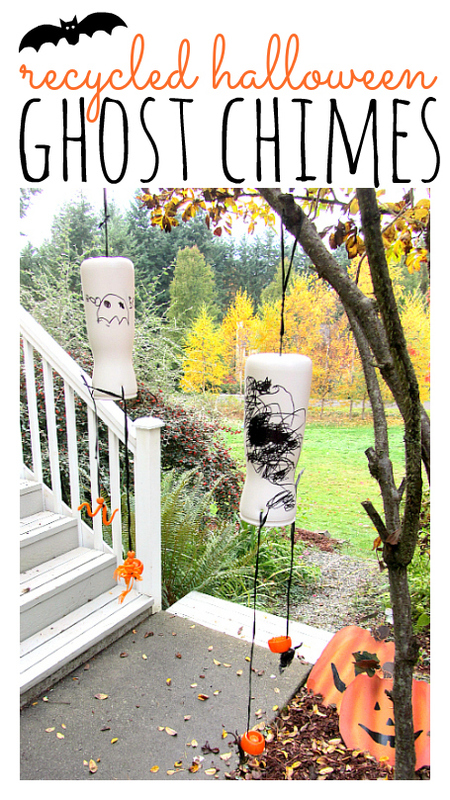 Hang up outside to delight the little goblins that will come to your house later this week looking for treats! He had such enormous fun that he called for another little ghost to come. 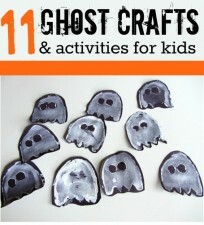 They had such enormous fun that they called for another little ghost to come. In my class I used to sing this starting at one side of the circle time rug calling each child over. My assistant teacher would be last. The children loved it so much I would do it for every theme from dinosaurs to Christmas elves! Thanks, I think I can use these pediasure bottles too. You are awesome. Absolutely wonderful…I just love your blog! So Real! Thank you for sharing! Thank you – hearing that means a lot. 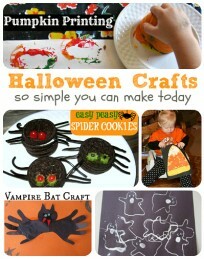 This is such a cute craft. 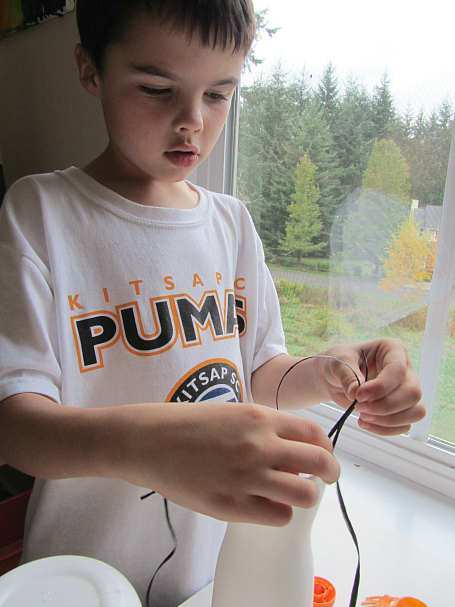 I wish my son still had enthusiasm for crafting with me. I hear you – mine is here and there. It’s like a craft needs a purpose for him. These were for outside so they were cool. Something for the fridge ? Not anymore.